Jeff Rossiter made the buying process easy and enjoyable. 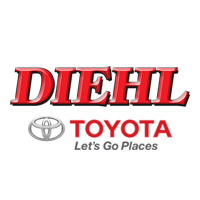 We had the best experience this week at Diehl Toyota. They were wonderful to work with and even had a place for the kids to play. Everyone was super nice and professional. Go see Jesus Pacheco, our salesman he was amazing to work with!!!! great car buying experience!!!!! I recently bought a 2019 Toyota Tundra TRD Pro from Diehl, both my salesman and the finance manager were top notch! I highly recommend the dealer, a great experience from top to bottom, they gave a good number on my trade and the whole process was seamless and without pain. 5 stars and as many thumbs up as I have!! I used the pickup and drop off service, which is always so convenient, as well as reliable. The drivers and the service department employees are very helpful and accommodating.